I really enjoyed this book a lot. It had everything I look for in a cozy: great characters, a realistic setting, adorable dogs and a intriguing mystery. The characters are well developed, well rounded and three dimensional. I loved Daphne, she was spunky and full of life. She was willing to do anything to prove her sister’s innocence. I enjoyed the bickering and banter between her and Detective Jonathan Black. I really enjoyed her sarcastic comments and thoughts and I was laughing out loud a lot when I was reading this book. I loved the fact that all of the dogs had their own distinct personalities. Socrates, the basset hound, is above the normal doggie behaviors, he is much too sophisticated. He does laugh at some of the things that Daphne does but he is always prim and proper. Artie is a bundle of energy and doggie exuberance. Artie has not been blessed with good look, with him missing an ear and his protruding tongue. But what he lacks in looks he more than makes up for in his behavior and antics. I loved the way Daphne was always talking to them and asking their opinions. They were as real of characters to me as the people were. The writing style flows smoothly and the book is a quick easy read. The author is very talented in her descriptive writing and I felt like I was right there, watching all the action take place. I could picture all of the animals in my mind, watching them in action. The mystery was well crafted and there were enough twists and turns to keep me guessing until the reveal at the end. I would recommend this book to anyone who enjoys a well crafted cozy mystery. And if you love animals, you definitely need to read this book. 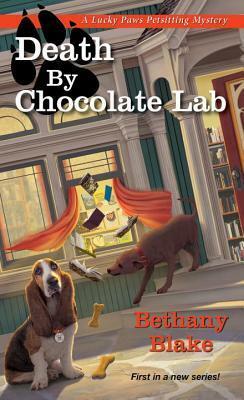 I am really looking forward to reading more adventures with Daphne and her lovable dogs. I received a free copy of this book from NetGalley in exchange for an honest review. I would like to thank NetGalley and Kensington Books for the opportunity to read and review this book.